KINGSTON, N.Y. – In keeping with Ulster County’s longstanding commitment to environmental leadership, Acting County Executive Adele B. Reiter today announced that Ulster County has joined The Climate Reality Project’s County Climate Coalition, formally affirming its commitment to the 2015 United Nations Paris Climate Agreement. Members of the County Climate Coalition are required to implement results-oriented measures to reduce greenhouse gas emissions. Ulster County is the first of New York State’s sixty-two counties to formalize its commitment to the Paris Agreement by joining the County Climate Coalition. In 2014, former County Executive Mike Hein issued an Executive Order establishing Ulster County as the first County government in New York State to purchase 100% of its electricity from renewable resources. Two years later, in 2016, Ulster County became the first to operate on a carbon-neutral basis; it remains the only county in New York State to do so. Ulster County formalized its commitments to renewable energy by joining the Climate Reality Project’s 100% Committed campaign in March 2018 and by completing a new 1.9 Megawatt solar generation facility atop a former landfill in the Town of Ulster last June. That facility now provides 20% of the electricity consumed by County operations. 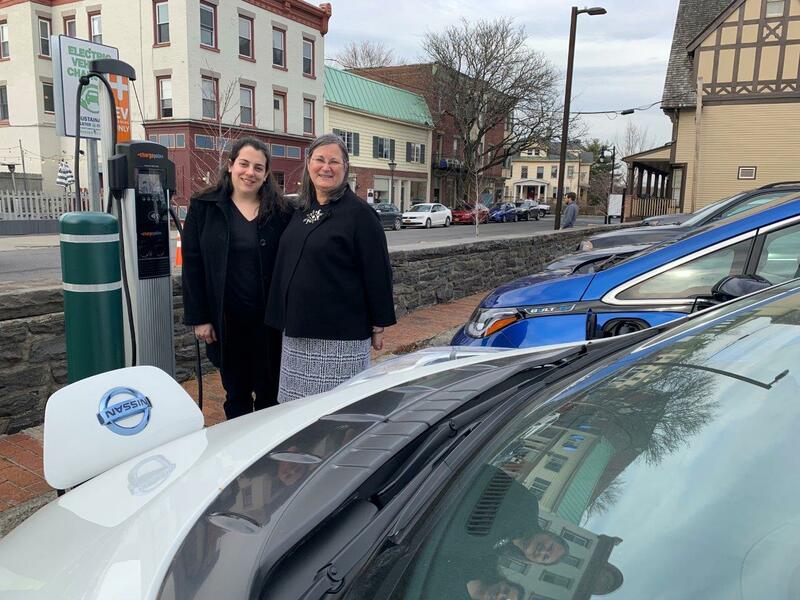 Photo: Acting Ulster County Executive Adele B. Reiter and Amanda LaValle, Director of the Department of the Environment stand beside a battery-electric vehicle, which is part of the County’s growing fleet of 28 electric and hybrid-electric vehicles.